Increasing costs of fertilisers has many broadacre cropping farmers considering alternative nutrient sources to apply to crops. Phosphorus-based fertiliser prices have been particularly volatile and expensive in recent years. Spent litter associated with broiler chicken production has gained attention from grain farmers in districts with chicken farms close at hand. It contains a variety of plant nutrients and is commonly used overseas as a source of crop nutrients. Until recently, little information existed on its use in Australian farming systems. From 2007 to 2012, Rural Directions Pty Ltd has conducted two RIRDC funded research projects examining the use of chicken litter as a broadacre crop fertiliser in South Australia. The project aimed to address frequently asked questions posed by broadacre users of chicken litter, and provide practical information on its use. Findings from the projects have been used to develop this guide for grain producers considering chicken litter as an alternative fertiliser. What is chicken litter's potential as fertiliser? Chicken litter contains useful amounts of phosphorus, nitrogen and potassium as well as trace elements zinc, manganese and copper. Nutrient contents can vary considerably between sources and batches (Table 1 and 2). Nutrient levels can vary by 100 per cent or more between litter sources and batches. Given this variability, it is important to obtain a nutrient content analysis of the product purchased to make sure it represents good value. Don’t assume that what you are told will be in there is actually present in the litter. Fresh litter contains 20 to 30 per cent moisture. Nutrient contents are generally quoted as percentage of dry weight (%dwt). When calculating the amount of nutrient to be applied, the nutrient content used in calculations needs to be reduced proportionately to provide a realistic estimate. Tip: Request an analysis of the litter you intend to purchase to check nutrient content, particularly phosphorus. This analysis can be carried out at several laboratories for around $30-$50 per sample. Alternatively, be conservative in your estimation of nutrient content to prevent under application. In trials on some soils, crops treated with chicken litter showed less early vigour compared to crops sown with conventional fertiliser in close proximity to the seed, particularly in low disturbance sowing systems. In most cases eventual grain yield was not affected, however, there were instances where yields were slightly lower than where conventional fertiliser was applied. The likely cause of vigour reductions is from the nutrients in chicken litter being either less available, or less accessible for uptake by the roots of the establishing crop. Much of the nutrient in chicken litter occurs in an organic form. As a result, microbial breakdown of the litter in the soil may temporarily ‘tie-up’ nutrients during the decomposition process. In addition, litter is mostly applied by broadcasting several weeks prior to seeding with no-till equipment (knife points and presswheels). Minimal incorporation of the litter occurs during the seeding process and as a result minimal litter ends up in the seed row in close proximity to the roots of germinating crop seedlings. In most cases, the reduction in vigour is phosphorus related. Vigour reductions are less likely in crops grown in soils with high background levels of available phosphorus. Grain analysis in field trials indicate lower levels of grain phosphorus in plots receiving chicken litter alone, compared with those treated with conventional phosphorus fertiliser helping to support this explanation. In most cases, the reduction in vigour is phosphorus related. Vigour and yield reductions are less likely in crops grown in soils with high background levels of available phosphorus. This problem is overcome when a “starter”application of some conventional fertiliser is applied in the seed row of the crop, in conjunction with the application of chicken litter. Depending on the phosphorus levels in the soil, often the rates of conventional fertiliser required to overcome this problem are significantly less than standard rates. 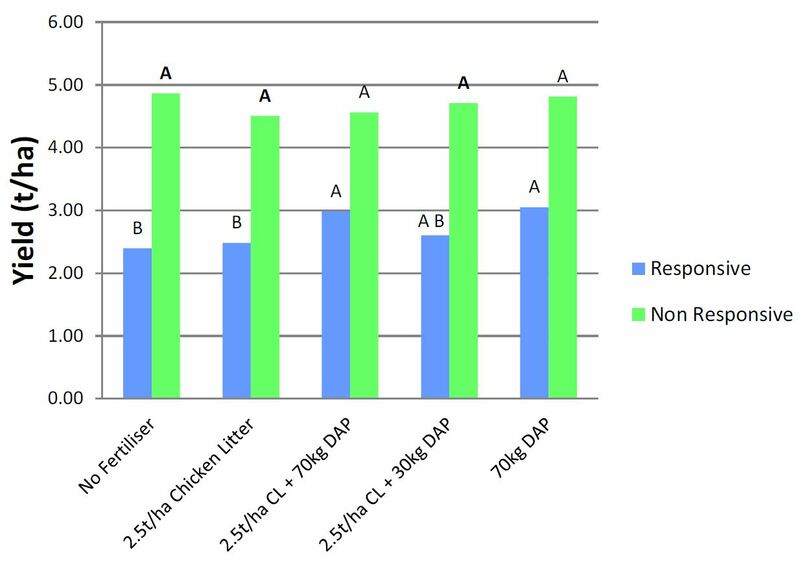 Figure 1 displays the results of trials where chicken litter was applied with and without conventional fertiliser on a phosphorus responsive (low phosphorus) and a non-phosphorus responsive (high phosphorus) soil. Starter fertiliser in the seed row was important to maintain yield at the phosphorus responsive soil, but there was no advantage on the non-responsive soil. 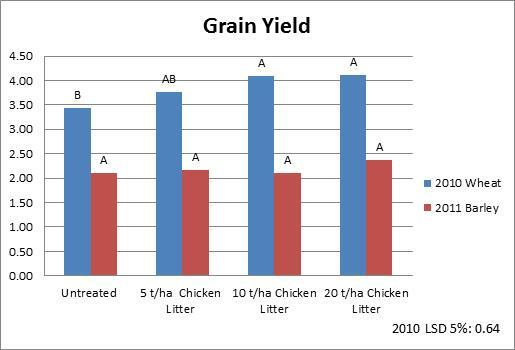 Figure 1: Wheat yield in response to combinations of chicken litter and conventional fertiliser applications at phosphorus responsive and phosphorus non-responsive sites at Freeling, SA in 2010. Tip: Use starter applications of conventional fertiliser in the seed row rather than using chicken litter if unsure of your paddock’s soil phosphorus status. Although chicken litter contains potentially useful amounts of nitrogen, a proportion of the nitrogen is lost as ammonia gas between spreading and incorporation via the seeding operation. Loss rates are quite high, with up to 25 per cent lost as ammonia in the week following application, particularly during warm weather. More than 50 per cent can be lost if the litter remains on the soil surface for extended periods without rainfall or physical incorporation. Immediate incorporation by cultivation or rainfall following application can increase the amount of nitrogen ‘preserved’ for use by the crop. This, however, is often impractical, or the negative effect of the additional cultivation on soil structure outweighs the potential benefit from the additional nitrogen. As a result, when raw chicken litter is applied without immediate incorporation, estimations of the nitrogen supplied may need to be discounted by up to 50 per cent to account for losses. Chicken litter also contains useful quantities of potassium and sulphur which can provide added value in soil types requiring additions of these nutrients. Chicken litter contains some trace elements. Zinc, copper and manganese are commonly deficient in many cropping soils. Chicken litter provides an opportunity to contribute to soil reserves of these nutrients. As with phosphorus, accessibility of trace elements by the roots of establishing crops is limited due to the nature of application and subsequent incorporation. Foliar nutrient applications may be required for these nutrients in potential deficiency situations, particularly in the short term after litter is applied. Tip: Although chicken litter provides useful amounts of trace elements to build soil levels in the longer term, however be prepared to address potential deficiencies with foliar nutrient sprays in crops grown on deficient soils. How do I use chicken litter on broadacre crops? Raw chicken litter is a light, bulky product, which requires high volume specialised spreaders to spread the litter effectively. Compared to conventional fertilisers which are applied during the sowing operation, the time required and costs of applying chicken litter per hectare can be high. Given the time and logistics involved, for most growers it is an impossible task to treat their entire cropping area in one year. For this reason, many chicken litter users will select a portion (say a third) of their cropping paddocks to be treated in any one year. The following year a different group of paddocks are treated, and a different group again in year three, with the aim of spreading litter over the whole farm every three to four years. Most crop nutrition strategies involving conventional fertilisers aim to apply sufficient nutrient to replace those removed in that year’s crop. To adopt a strategy of applying chicken litter at nutrient replacement or ‘maintenance’ rates, is probably not the most cost or time effective strategy. Chicken litter provides an opportunity to build soil reserves of nutrients (phosphorus in particular) when applied at higher than maintenance rates. As a result, chicken litter application rates of 2.5 to 3 tonnes per hectare (depending on nutrient content) are commonly applied to ‘build’ soil reserves, rather than ‘maintenance’ rates of 1 to 2 tonnes per hectare. Soils with low background levels of phosphorus and trace elements are well suited to this nutrient building strategy. Depending on the cost of the product, chicken litter may provide a cheaper alternative to build soil reserves than applying high rates of conventional fertilisers. Tip: Apply above maintenance rates of litter to build soil phosphorus reserves for future utilisation. Soils with good phosphorus levels are also suited to chicken litter applications, but with a slightly different objective. The aim of applying chicken litter may be to further build soil phosphorus reserves, with a view to ‘mining’ those reserves in future years (particularly in years when conventional fertilisers are very expensive) by applying less than maintenance rates of conventional fertiliser. Trials indicate that the nitrogen applied in chicken litter can significantly increase grain protein levels compared to where a conventional DAP based fertiliser was applied (but not reliably due to the unpredictability of nitrogen losses after application). Increased grain protein is an advantage in crops such as bread and durum wheat where higher protein levels attract price premiums. However, it may impact negatively on crops requiring low grain protein such as malt barley and soft wheat. Excess nitrogen applied to cereal crops can result in lodging in good crop growth environments, or high grain screenings levels in a dry seasonal finish. The risk of negative impacts of high rates of nitrogen application are reduced if litter is applied to soils low in soil nitrogen (i.e. paddocks following a cereal crop, sandy soil types) or in crops where high grain protein is an advantage rather than a penalty (i.e. bread wheat, durum wheat). Tip: Target crops where high grain protein is an advantage or soils low in stored soil nitrogen for chicken litter applications to avoid problems with excess nitrogen supply. Soil nitrogen testing prior to application of litter will indicate paddocks at higher risk. Growers in some cropping districts are applying high rates of chicken litter to poor producing or problem soils in an attempt to improve them. Low fertility sand hills and low organic matter, hard- setting areas are particularly targeted with rates of chicken litter 2 to 5 times higher than district practice rates with the aim of supplying high quantities of nutrients and organic matter to boost fertility levels. Trials on a low fertility sandhill in SA’s mid North cropping district measured substantial cereal yield and vigour increases with the application of high rates of chicken litter. In addition, high rates of litter application increased soil macro nutrient and organic carbon levels. Care needs to be exercised with high rates of application as crops are more prone to lodging and high grain screenings levels due to excessive nitrogen supply. Tip: Consider applying higher rates of chicken litter to improve the background fertility of poor soils. Due to the light, bulky nature of chicken litter, application using conventional fertiliser spreaders is often time consuming due to the high volumes of products required. Specialised high volume manure spreaders do a far better job, but require considerable capital investment. Spreading contractors are usually present in areas where chicken litter is readily available. In Southern Australia, chicken litter is usually spread during autumn, several weeks prior to seeding, with incorporation being achieved by the seeding operation. In no-till sowing systems (one pass sowing with knife points and presswheels), ideally the litter should be applied as close to seeding time as possible. By doing this the litter is incorporated into the soil shortly after application to maximise utilisation of the nitrogen contained in the litter. Alternatively, timing litter applications just prior to rainfall maximises nitrogen utilisation. In practice, this is rarely achieved due to the availability of spreading contractors. As a consequence, a significant portion of the nitrogen contained in the litter is lost and can not be relied upon to supply crop requirements. Additional nitrogen fertiliser may be required by crops even though litter has been applied. Chicken litters are produced from a variety of base materials. Source materials include cereal straw, wood shavings, sawdust and rice hulls. Some litters are reused for subsequent batches of chickens (multi- batched litters). Composted litters tend to be denser, cheaper to transport and easy-to-handle, however, they are considerably more expensive than raw litter products. Trial results indicate little difference in crop responses between litter types. The key to chicken litter providing value for money is the cost per unit of target nutrients (usually phosphorus) after taking the cost of the litter, transport and application into account. Tip: Calculate the cost per unit of nutrient supplied after taking transport and spreading into account when deciding on which litter to use. Are there any environmental concerns in using chicken litter? There is a risk of nutrient accumulation in soils with regular applications of high rates of chicken litter in the longer term. Phosphorus, zinc, and copper, although essential plant nutrients, can accumulate in soils over time, causing nutrient imbalances. For this reason, it is recommended that soil tests are conducted to establish a baseline for soil nutrients before undertaking a long term chicken litter application program. Chicken litters often contain elevated levels of micronutrients (zinc and copper in particular). These nutrients should be tested as well as macronutrients (phosphorus, nitrogen, sulphur and potassium). This will allow levels to be checked in subsequent years to identify any potential nutrient accumulation issues. Chicken litter can also contain trace levels of heavy metals. An extensive survey of chicken litter supplies in 2010 indicated that in general, levels of arsenic, chromium, lead, cadmium, mercury and nickel in chicken litter were comparatively low in relation to standards set for recycled organic waste products. Chicken litter contains varying levels of salt. Soil testing is recommended to establish a baseline Electrical Conductivity level (EC) and Exchangeable Sodium Percentage (ESP) so that increases can be monitored over time. Applying chicken litter to saline soils should be avoided. Care needs to be taken not to contaminate water supplies when spreading chicken litter. Nutrients contained in the litter can cause algal blooms. Buffer distances have been set by several State authorities in relation to litter applications near permanent and intermittent creeks, bores and dams. Litter should not be applied to land with a slope greater than 8 per cent due to the risk of runoff and subsequent contamination of water courses. Chicken litter odours linger for several days after spreading. Unfortunately, neighbours often don’t appreciate the rich ‘organic’ smell, which can cause considerable annoyance! In addition, most litters are dusty in nature which arouses concerns over contamination of rainwater supplies. Chicken litter is intended for a paddock in South Australia’s Mid North district on a clay loam soil with surplus potassium. Periodic zinc additions are required on this soil type to avoid deficiencies. Intended application rate – 2.5 tonnes per ha per hectare (or 6.25m3). Contract spreading cost - $6 per m3. Freight (chicken farm to paddock) - $4 per m3. Litter cost - $6 per m3 (ex chicken farm). Litter weight – 1 tonne of litter equals 2.5 cubic metres. Of the nutrients listed in Table 5, phosphorus, zinc and a proportion of the nitrogen will be the basis for valuing the chicken litter given that in the example, the soil already has surplus potassium. Of the total nitrogen applied, only 25 per cent in the litter will be valued. This assumes that 50 per cent of the nitrogen is lost as ammonia between spreading and incorporation, and discounts the nitrogen a further 25 per cent to account for free nitrogen contained in DAP (remembering that DAP contains 18 per cent nitrogen as well as 20 per cent phosphorus). On this basis, the litter will be appropriately valued using the nutrient values ($/kg) of DAP, zinc sulphate and urea. Note that no application costs are factored into the nutrient values ($/kg) for DAP and zinc sulphate. It is assumed that these fertilisers would be applied as part of other cropping operations (i.e. the seeding operation or herbicide applications). If a dedicated operation was required to apply these products, nutrient values ($/kg) would need to be adjusted upwards. In this example there is an economic advantage ($24.33 per hectare) in using chicken litter instead of mineral fertiliser. Case Study: Gavin Schuster, Freeling, SA. Straw and hay production are a large part of the Schuster’s enterprise. To balance nutrient and organic matter removal, the Schusters apply chicken litter to 40-50 per cent of their area each year. ‘We are also looking at ways to build up our soil fertility at low cost’, Gavin said. The Schusters apply a standard rate of 2.5t/ha on cropping paddocks in March- April every two to three years but increase the rate to three tonnes per hectare on poorer sandy soils. Generally the chicken litter is spread prior to wheat and canola in the rotation to capitalise on the nitrogen contained in the litter. ‘We adjust down the rate of nitrogen applied when we use chicken litter, as we have burnt crops off in the past from applying too much N’, Gavin said. After years of applying chicken litter the Schusters have now begun to decrease their application rates of conventional fertiliser. In the past the Schusters applied 100-120kg of DAP/ha at seeding along with the application of chicken litter. More recently, they have reduced the base rate of DAP to 80kg/ha. ‘Originally we were targeting 40ppm of Colwell P in the soil and have used chicken litter to achieve this’, Gavin said. ‘Our soil tests now show up to 50-60ppm of P, which gives us confidence to crank things back’. Gavin believes they could now cut their DAP rate back to 40kg/ha in conjunction with their chicken litter and still maintain production. ‘We also use chicken litter to supply our soil trace element needs, especially zinc and copper, and as well some sulphur’. The Schusters source raw straw- based chicken litter direct from a local commercial chicken farm. Some composted chicken litter is also purchased for spreading paddocks within 500m of the town of Freeling to manage the odour associated with litter applications. ‘We make sure we spread when the wind is not likely to blow towards the town for two days after spreading’, Gavin said. ‘We need to do the right thing and not get people in the town offside’. Five years ago the Schusters purchased a high capacity, French-manufactured Rolland spreader. It holds 15 cubic metres (six tonnes) of chicken litter, with a spreading width of up to nine metres. Gavin stresses the importance of an efficient spreading operation when utilising chicken litter. ‘Straw-based litter needs a spreader with a spinner deck and a chain base to spread effectively’ Gavin said. ‘The horizontal beaters on our machine also help to achieve a more even spread’. Maximising efficiencies associated with the spreading operation is important to the Schusters. Two people are assigned to the spreading operation, one on the spreader and the other in the loader. A telehandler equipped with a large, 3.5 cubic metre bucket is used to load the spreader. Extra efficiency is also achieved by the litter being delivered in piles along the centre of the paddock. This minimises the time spent driving over to piles when loading. With the Schuster’s current setup, they are able to spread around 80 hectares per day. ‘GPS guidance is essential when spreading litter,’ according to Gavin. ‘You can’t see where you’ve been so guidance is needed to minimise ‘double ups’ and misses’. Consider the costs associated with spreading and cartage as these costs can often be as much per tonne as the product itself. Also consider the cost of the time needed to cart and spread the product. It can be time consuming. When storing the litter ensure it is kept in long, low rows no higher than 2m high. This reduces the compaction of the product in the heap which will reduce the chance of spontaneous combustion. Avoid over-application of nitrogen when using chicken litter, particularly in poor seasons. Be mindful that nitrogen fertiliser applications may need to be adjusted down when using chicken litter. Craig Paech first used chicken litter in 2008 when conventional fertiliser prices doubled. As part of a strategy to save on fertiliser costs, Craig cleaned out several local chicken sheds, transported the litter to his farm and spread it onto cropping paddocks. ‘We didn’t spread chicken litter on our lower rainfall block because we were worried about burning off our crops due to their extra bulk’ Craig said. ‘We were able to purchase our spreader with what we saved on fertiliser in that year’, Craig said. Craig has also trialled chicken litter on his south east property, on veldt grass pastures with good visual responses. Craig views chicken litter as a replacement for conventional fertiliser. In the first years of application, Craig applied 60kg/ha of single superphosphate in addition to chicken litter. ‘Some of our paddocks have now had up to four applications of chicken litter and others between two and three applications’, Craig said. ‘We are now confident that our fertility has built up to a point where we won’t use conventional fertiliser on 90 per cent of our cropping area’. A mixture of 50 per cent straw-based and 50 per cent sawdust-based product is applied, by layering the different litter types in the spreader during loading. The addition of sawdust-based product minimises blockages in the spreader. ‘We put a layer of sawdust based product in the bottom of the spreader, then a layer of straw-based product, then another layer of sawdust-based then fill the remainder of the spreader with straw- based product’, Craig said. The litter is sourced from several chicken meat farms 15-20km away. The chicken farms transport the litter to Craig’s farm and charge on a per cubic metre basis. The chicken litter is applied pre seeding during March at 2.5t/ha. If a good rain is forecasted earlier, Craig will aim to spread as much as he can before the rain to maximise nitrogen utilisation. Craig however acknowledges this is hard to predict in his area because of the unreliable nature of rainfall. Craig owns a Marshall 810 spreader fitted with bulk sides to achieve a capacity of 13.2m3. ‘Our loader is fitted with a 2.2m3 bucket and with two people on the job, we can spread around 200acres per day’, he added. Don’t use all straw-based products when spreading with a belt spreader. A mix between sawdust and straw- based products will aid spreadability. Mix the products when loading the spreader rather than amalgamating piles in the paddock. Set up the piles centrally as a ‘mixing station’ in the paddock to be spread, but try to minimise the size of the areas associated with the piles as nothing grows in the area in the year following. Keep the doors and windows of the tractor shut! Ben Marshman and his father Ray first used chicken litter in 2010, after purchasing a high volume spreader in a syndicate with two other local growers, with the aim of supplying phosphorus to their soils at lower cost. Ben sees chicken litter as a convenient method of providing a blanket application of nutrients over their land. ‘Chicken litter seems to have everything in it including all the trace elements our crops need’, Ben mentioned. ‘It’s a good way of replacing the phosphorus and trace elements we remove in grain’. The Marshmans normally apply chicken litter at five cubic metres (or 2 tonnes) per hectare, although heavier rates are applied on poorer soils to more rapidly improve soil fertility. ‘In 2011, we applied chicken litter at higher rates on some poorer quality land with great results and less yield variation across paddocks’, Ben said. ‘We target paddocks planned for canola as a first priority, as we think that canola uses the litter more effectively in the first year with its fine roots near the soil surface’. ‘We use some starter MAP at seeding in paddocks spread with chicken litter, usually at rates around the 40kg/ha mark’, Ben said. The Marshmans and the other two growers in the spreader syndicate use raw product sourced from chicken sheds at Owen, Hamley Bridge and Dublin. ‘Our deal is we take all the litter from the shed but we need to take it when the chicken farm needs to get rid of it. This means we need to have somewhere to dump the litter at all times of the year’, Ben said. ‘Managing the logistics is a challenge at times as suppliers can dump the chicken manure at anytime during the season,’ according to Ben. ‘This can result in some crop area being run over when transporting the litter out into the paddocks where it is going to be spread’. Chicken litter is applied in March prior to seeding using a 28 cubic meter capacity, high volume Rolland spreader and spreading on a 10m spreading width. ‘On a good day, we are able to spread120ha per day with our machine’, Ben mentioned. Ben also owns a JCB telehandler, fitted with a bucket for handling the chicken litter and loading the spreader. Be aware of the odour associated with raw chicken litter, it can cause issues with neighbours, particularly if used close to towns. The logistics of storing a bulky product like chicken litter can cause hassles especially when paddocks are wet. From a practical perspective, five cubic metres per hectare is a minimum application rate. Having a spreader with choppers and not just spinners is ideal. The choppers deliver a finer and more consistent product onto the spinners with less lumps, providing a more consistent coverage. The Peels have been utilising chicken litter from their broiler sheds for at least 30 years. The Peel’s 300,000 bird chicken farm supplies enough chicken litter to spread onto approximately 1,000 hectares each year. ‘We use all the litter our sheds produce on our own farm, and sometimes on the share farming land.’ says Rowan. ‘The only time we have had to sell chicken litter is when it has been too wet to get onto our own paddocks’. The chicken litter is spread onto cropping and pasture ground at approximately 2.5t/ ha. ‘We usually spread chicken litter onto pastures instead of using traditional fertilisers, whereas on the cropping country we use it as a way to reduce the rates of fertiliser used’. ‘At the rates we apply we generally only need to put out a bit of traditional fertiliser with the seed, roughly 50 kg/ha’, Rowan said. In the past the Peel’s found that putting the chicken litter out at very high rates caused crops to grow excessively at the expense of eventual yield and grain quality. As a result they have adopted a strategy of applying lower rates. ‘We get a better outcome using the chicken litter more regularly, but at lower rates.’ Rowan concluded. The Peels have designed a custom built spreader to suit their controlled traffic farming system. After harvest their chaser bin is converted into a spreader by removing the bottom section of the bin and adding belts that drive two spinners. The chaser bin/spreader has a capacity of 18 tonnes which reduces the time spent loading, however towing the larger chaser bin requires slower ground speeds than a conventional spreader. Chicken litter is easiest to spread once it has been stockpiled for a period of time. Litter spread straight out of the shed is too light and fluffy to spread effectively. Don’t apply litter at high a rates in cropping country otherwise uncontrolled crop growth will result. Craddock, TD and Hollitt, JF (2010), Piloting Chicken Litter in Broadacre Farming – Setting Research Directions; RIRDC Report.